An excellent source of beta-carotene, carrots should be included into your toddler’s everyday diet. After consumption, the beta-carotene is converted into Vitamin A. Also rich in vitamin B6, dietary fiber, and thiamin, they help to slow the absorption of sugar into the bloodstream. 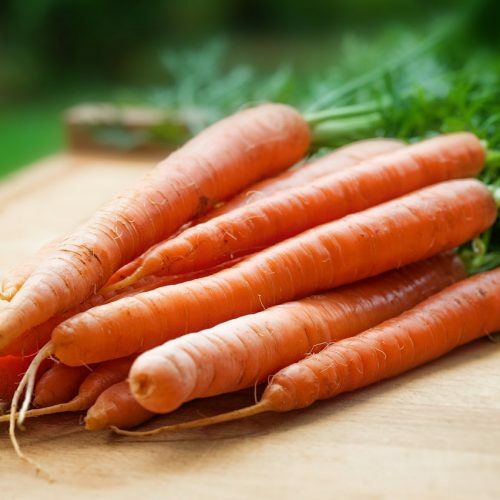 Eating carrots play a large role in the development of the immune system as well as anti-aging properties. Even if your toddler is a fussy eater, there are easy ways to incorporate carrots in recipes that taste great. Combine milk, eggs, and butter in a blender. Add the carrots and blend until there are no more chunks left. Add in the dry ingredients (flour, baking powder, salt, sugar). Finally, add the nutmeg and cinnamon. Heat a medium sized pan and cook until golden brown. Saute onion in olive oil until softened. Add the shredded potatoes and carrots for 5 minutes, then add garlic and peas. Stir frequently. Season with salt and pepper, and continue cooking for 3 minutes. Remove from heat. Stir in lemon juice, breadcrumbs, and corn flour, then set mixture aside to cool. Shape the mixture into 15-20 meatballs, then place in the fridge for 30 minutes. Cook in hot oil for 3-6 minutes, and then place onto paper towel to drain. Heat oil in large Dutch oven, cook onion and carrots for 10 minutes. Stir in salt, pepper, and ginger. Add water and broth, bring to a boil. Cover and reduce heat, let simmer for 25 minutes or until carrots are tender. Remove from heat and let cool. Place half of the carrot mixture and 1 tablespoon of cream into a blender and blend for 20 seconds. Place the mixture in a large bowl and do the same with the rest of the carrot mixture and remaining tablespoon of cream. Return mixture to pan and heat until the desired temperature has been achieved. Preheat oven to 400-degrees. Peel carrots and parsnips, halving crosswise. Then, slice lengthwise into ¼-inch strips. Place on baking sheet and toss with salt and oil. Spread onto a single layer and bake for 20 minutes, turning over once halfway through cooking. Preheat oven to 350-degrees. Combine carrots, ¼ cup water, orange juice, and orange zest in a medium saucepan. Season with salt and bring to boil. Simmer over moderate heat for 30 minutes. Discard zest and transfer carrot mixture into a blender and puree. Boil water and cook penne until al dente, reserving 1 cup of cooking water. Return pasta to pot, add reserved water and carrot mixture. Cook over medium heat for 5 minutes until sauce begins to thicken. Stir in ¾ of cheese until creamy, then add the remainder of cheese. Season with tarragon and white pepper. Transfer pasta into a baking dish and bake for 20 minutes. Preheat oven to 425-degrees. Grease your muffin tray (if necessary). In a large bowl, mix flour, baking powder, cinnamon, baking soda, salt, ginger, and nutmeg. In a small bowl, combine raisins and 1 teaspoon flour to prevent sticking. Add grated carrots, chopped walnuts, and floured raisins to the other ingredients. In a medium bowl, combine oil and maple syrup. Beat with whisk. Then add eggs, yogurt, and vanilla extract. Combine the wet and dry ingredients. Mix together with a big spoon. Divide batter evenly, sprinkle raw sugar on top, and bake for 13 minutes. Carrots are delicious and easy for kids to eat. They help with keeping vision sharp and skin healthy. Also, they are known for aiding in proper digestion and can help with constipation. In the long run, they are even known to prevent cancer, stroke, and heart disease. Overall, carrots are great for the body and contain many positive benefits. They should be eaten and enjoyed regularly.